The total healthcare costs of Vitiligo were estimated at $49 million, with a lost productivity of $6 million and an average cost per patient of $328. There are a few companies that are working on creating solutions that could end the suffering and social stigma attached to this disease. Vitiligo is an autoimmune condition that is characterized by loss of pigmentation, that affected 150, 000 Americans across all age groups according to a Burden of Skin Disease report commissioned by the American Academy of Dermatology in 2013. The total healthcare costs of Vitiligo were estimated at $49 million, with a lost productivity of $6 million and an average cost per patient of $328. The latest reports however suggest that the number of people affected may be between 2 to 5 million in the U.S alone. 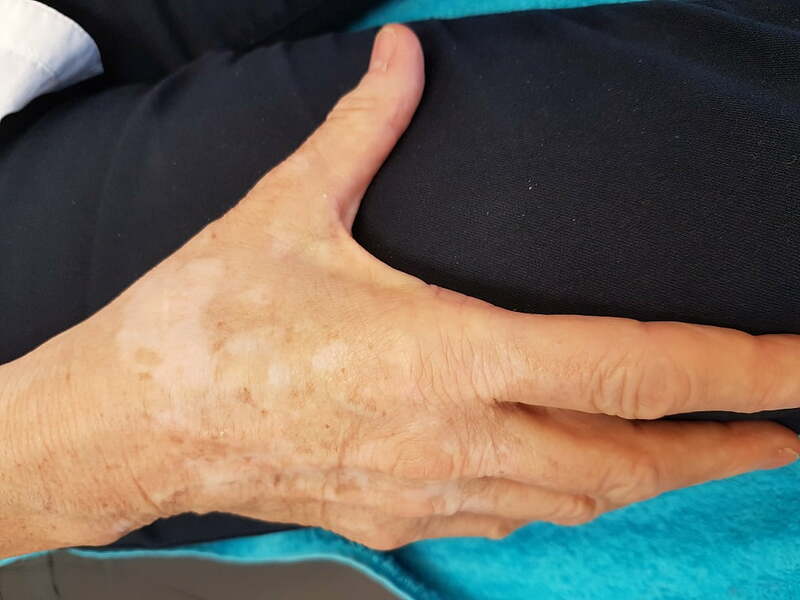 There is currently no cure available for this disorder; however, treatment options such as steroid based creams, UVA and UVB light treatments, skin grafting and depigmentation creams help alleviate the condition. A research report by Zion Market Research projects the global Pigmentation Disorders Treatment Market which was worth USD 5,283.82 million in 2017 is expected to reach USD 8,479.08 Million by 2024 growing at a CAGR of 7.02%. The rise in incidences of skin disorders, increased lifestyle spending on beauty and self-grooming, higher disposable incomes, advancements in research and development and rising global warming will help in the growth of the market. However, the cost of treatment and a major lack of awareness will impede the growth in the market. 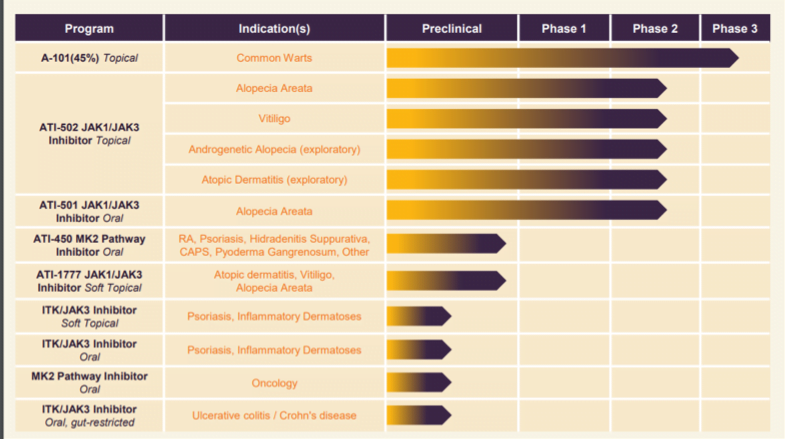 Aclaris is a biotechnology company with focus on creating solutions for areas of dermatology that is lacking in FDA-approved therapies especially in skin and hair related disorders. The company’s pipeline consists of drug candidates for treatment of Common warts, Alopcia Areta, Vitiligo, Atopic Dermatitis, Rheumatoid Arthritis, Psoriasis, etc. that seek to unlock the potential of Kinome, a subset of human genome, to control dysregulation and/or mutations of cells. 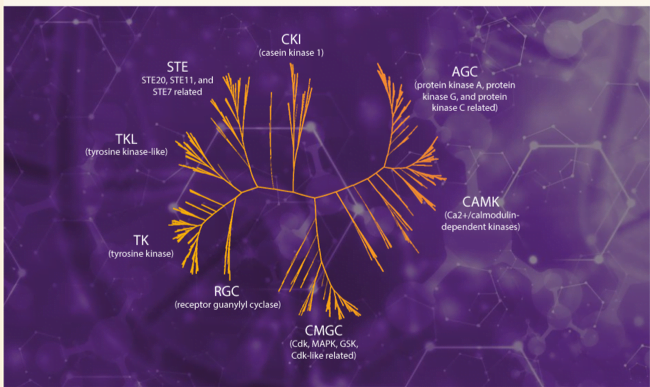 Its proprietary KINect™ platform can identify drug candidates with the help of its chemical library of kinase inhibitors, a structure based drug design and a custom kinase assay. 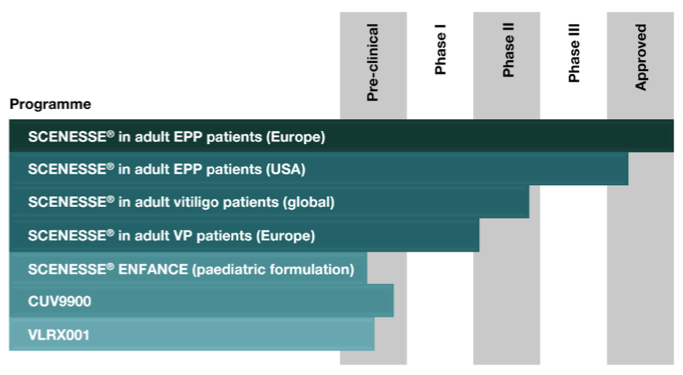 The companies lead drug candidate for Vitiligo is ATI-502, a JAK1/JAK3 Inhibitor and ATI-1777, a JAK1/JAK3 Inhibitor that are currently in Phase II clinical trial and IND enabling studies respectively. 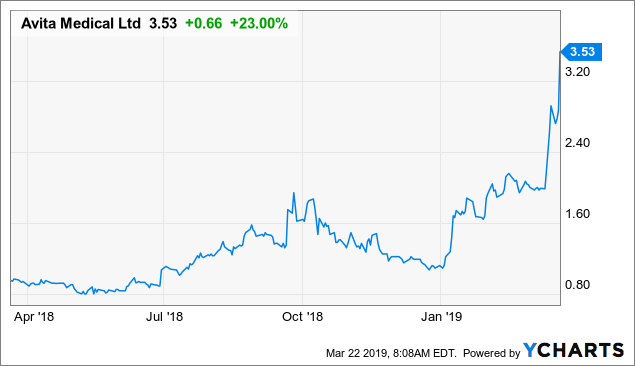 It presently markets two products eskata (hydrogen peroxide) topical solution, 40% and Rhofade (oxymetazoline HCI) cream, 1% that it acquired from Allergan Sales, LLC. The company is currently seeking partnerships for in-licensing commercial-stage or developmental-stage aesthetic dermatology treatments and out-licensing rights for its investigational protein kinase inhibitors for non-dermatology indications along with out-licensing commercial rights outside of the United States for seborrheic keratoses and common warts. It also wants to collaborate with research partners for its KINectTM Platform for drug discovery for treatment of autoimmune diseases and for new applications of its cysteinome-targeted chemical library representing 60% of the kinome. As per its Q3, 2018 financial results, cash and cash equivalents stood at $134 million. 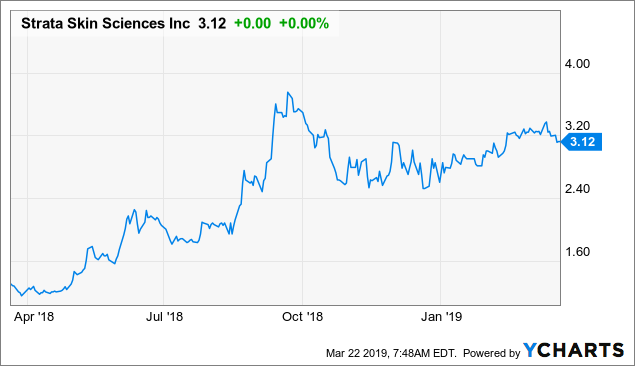 In addition, the company made a public offering of 9,941,750 shares of its common stock at a price to the public of $10.75 per share for total gross proceeds of approximately $106.9 million. This biopharmaceutical company is committed to finding cures for skin and genetic disorders with its lead product candidate SCENESSE® (afamelanotide 16mg), a novel photoprotective drug for the treatment of erythropoietic protoporphyria (EPP) and prevention of phototoxicity in adult patients. It is currently engaged in Phase II and phase III trials in the US and Europe. 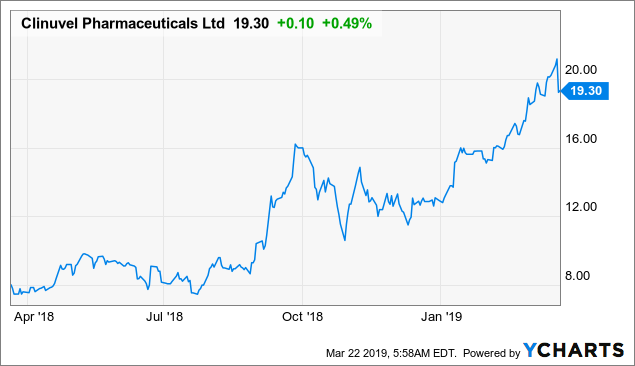 The drug has already been granted marketing authorization under exceptional circumstances in Europe, and has submitted a new drug application to the FDA in the U.S and is awaiting marketing approvals. It is also conducting clinical trials for Vitiligo. SCENESSE® is based on the company’s path breaking work on synthesising human hormones using the properties of alpha-MSH (melanocyte stimulating hormone) to protect the human skin with the development of a first-in class dissolvable implant that could mimic the benefits of the sun minus the damage for treatment of disorders such as erythropoietic proto- and congenital porphyria [EPP, CEP], Solar Urticaria and other light-induced diseases. SCENESSE® is a chemical analogue of α-MSH and is a linear peptide with 13 amino acids. It combines its expertise and understating of electromagnetic spectrum, skin physiology and the interaction between light and environment to come up with innovations in fields of erythropoietic porphyria, Variegate porphyria (VP), Xeroderma Pigmentosum (XP) to name a few. It has successfully completed clinical trials for studying the efficacy of re-pigmentation therapy in Vitiligo. As per the company, its SCENESSE® is being evaluated for its ability to activate melanocytes within the vitiliginous lesions and achieve repigmentation in combination with NB-UVB in patients with vitiligo. 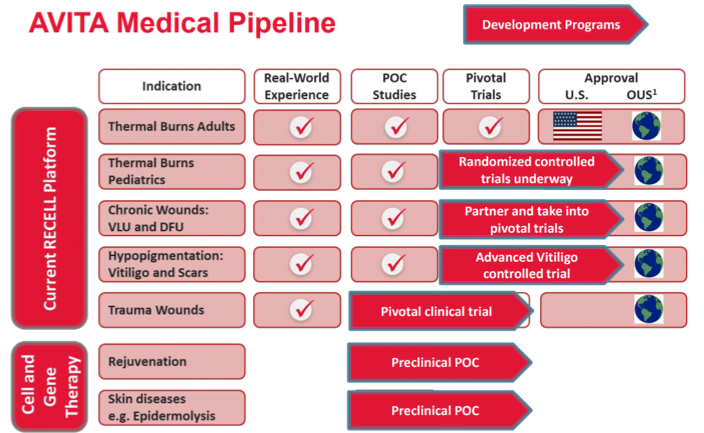 Its product pipeline consists of CUV9900, an alpha-Melanocyte Stimulating Hormone (alpha-MSH) analogue with skin protection capabilities, VLRX001, a melanocortin analogue that can improve and prolong cellular activity and is intended for topical administration for patients suffering from Vitiligo that is being developed through CLINUVEL’s Singaporean subsidiary. As per its financial results, the revenues as on December, 2018 stood at $8.98 million, while the net profits were reported to be at $4.08 million. 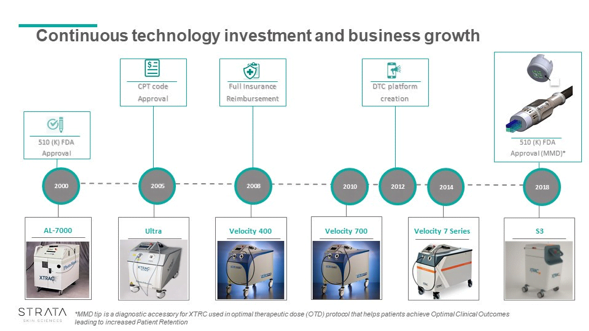 The company’s proprietary XTRAC and VTRAC excimer laser device use UVB light to treat Psoriasis, Vitiligo Eczema, Leukoderma and Atopic Dermatitis with minimal peripheral tissue damage overcoming limitations of conventional treatment options such as biologics, drug therapies, application of topical lotions and UV treatment. 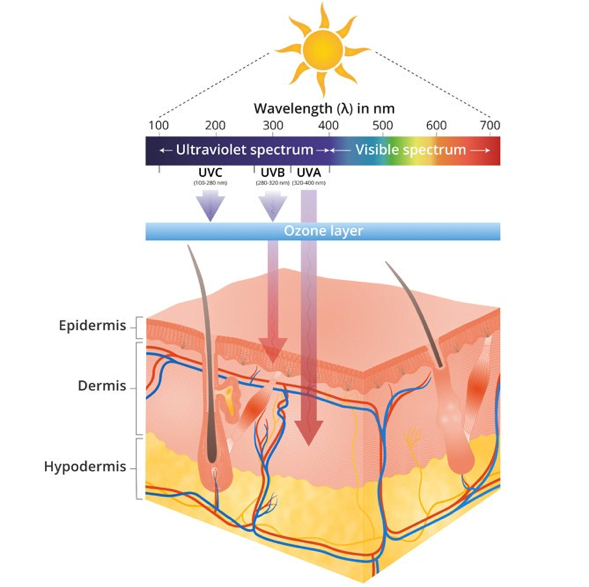 XTRAC produces a monochromatic wavelength (308nm) of UV light that has shown to reduce psoriasis lesions by 95 percent in 10-12 treatments offering long-lasting relief. It also manufactures a micropigmentation Biolock Cartridge that is gamma ray treated and sealed in individual packages for use by skincare professionals, both XTRAC and VTRAC have been proven to be safe and effective with multiple FDA 501(K) and other international clearances and over 2000 devices installed worldwide to vouch for their efficacy. 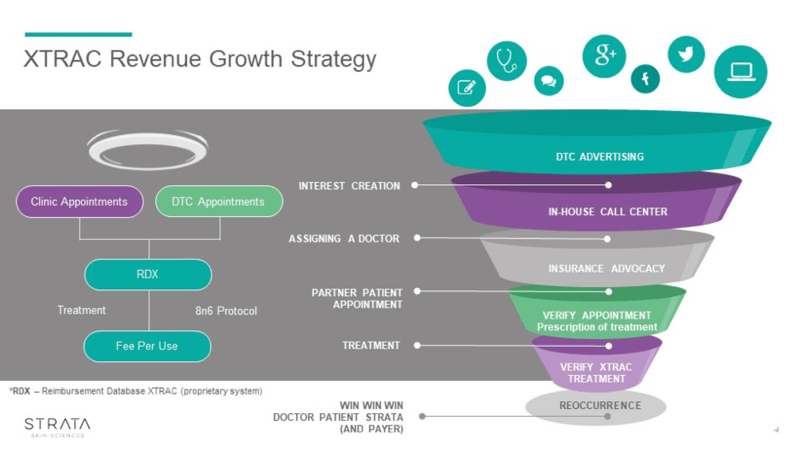 The company is fully focused on commercializing its technology and has multiple strategies in place which includes a DTC marketing platform, centre of excellence partner clinics which yield revenue of an estimated $500,000 per year. It has a strong network of partnerships with leading teaching institutions such as Stanford University, Mount Sinai, Cleveland Clinic , University of Michigan to name a few. As per the company’s Q3, 2018 financial results, it reported total revenues of $7.9 million with XTRAC contributing to $5.6 of the total revenue. Its cash and cash equivalents stood at $15.9 million as of September 2018. A pioneer in regenerative medicine, Avita’s proprietary RECELL system is an autologous cell harvesting device that can produce a suspension of Spray-On Skin™ Cells using a patient’s own skin cells to regenerate the outer layer of skin all under 30 minutes. The company growth strategy is focused on creating solutions for areas with unmet medical needs such as Vitiligo, Trauma and chronic wounds, aesthetic cell and gene therapy. It received FDA approval for RECELL System® PMA as a Class III device for treatment of acute thermal burns. It has a strong pipeline of candidates under different stages of development. It has entered into collaboration with U.S. Biomedical Advanced Research and Development Authority (BARDA) as part of its disaster preparedness and response initiative for an estimated contract value of US$80.1 million. Avita Medical has entered into collaboration with the Japan-based COSMOTEC for marketing and distribution of RECELL® Autologous Cell Harvesting Device (RECELL® System), the company has submitted a Japan’s Pharmaceuticals and Medical Devices Act (“JPMDA”) application for marketing approvals in Japan for treatment of Vitiligo that affects over two million people in Japan, in addition to being considered as a treatment for severe burns chronic wounds and decubitus ulcers. A biopharmaceutical company with a diverse pipeline of drug candidates under development, Arrien’s ARN-4079 is an orally available Janus Kinase 3 (JAK3) inhibitor that is irreversible, durable and has the potential to treat inflammatory and autoimmune diseases such as Vitiligo, Rheumatoid Arthritis, atopic dermatitis and other skin disorders. 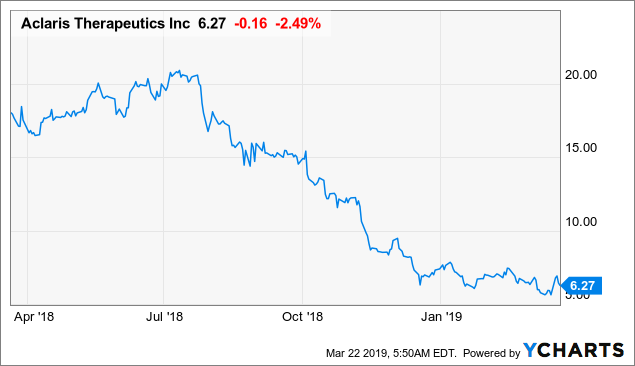 The company plans to file for an Investigation New Drug Status for ARN-4079 with the FDA and is seeking partnerships that will enable it to fulfill IND enabling studies and Phase I clinical trials. Its pipeline based on its proprietary FIELDS (Fields Ion Pairs/Hydrogen Bonds Electrostatics Linear Free-Energy Desolvation/Polar Scoring/Clustering), also consists of candidates targeted for oncology indications. The company has entered into collaboration with Boston Pharmaceuticals for conducting Phase I clinical trials of ARN-6039; Its ARN-3261 is a SIK2 inhibitor that will commence Phase I clinical trials in Q1, 2019 for the treatment of ovarian and solid tumors. Its drug candidate for glioblastoma and lung cancer is ARN-0953, while ARN-0894 is a small molecule in development for application in Immuno-Oncology. It’s autoimmune and inflammatory drug pipeline consists of ARN-6069, ARN-4079 for treatment of Psoriasis, Vitiligo, etc. It is also developing ARN-1104 for the treatment of Parkinson’s.